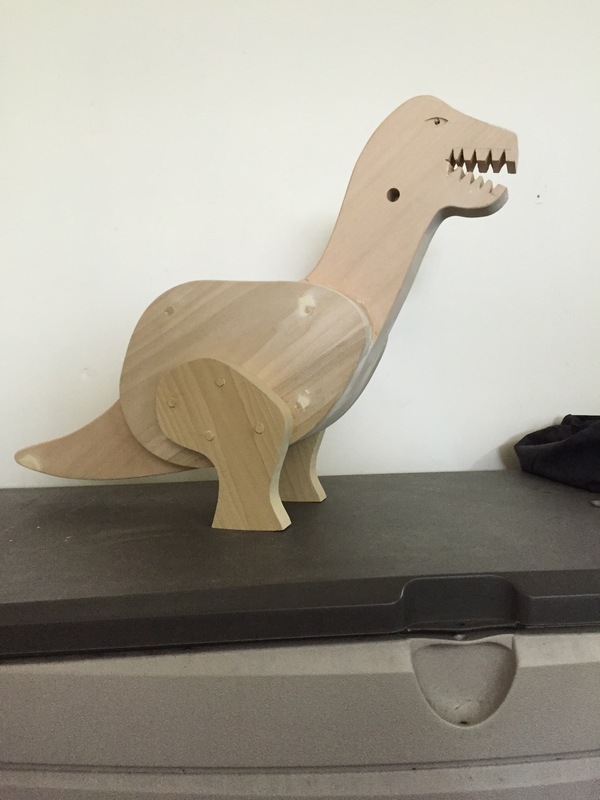 Before my son was born I started building the rocking dinosaur project from Jeff Millers book “Children’s Furniture Projects”. 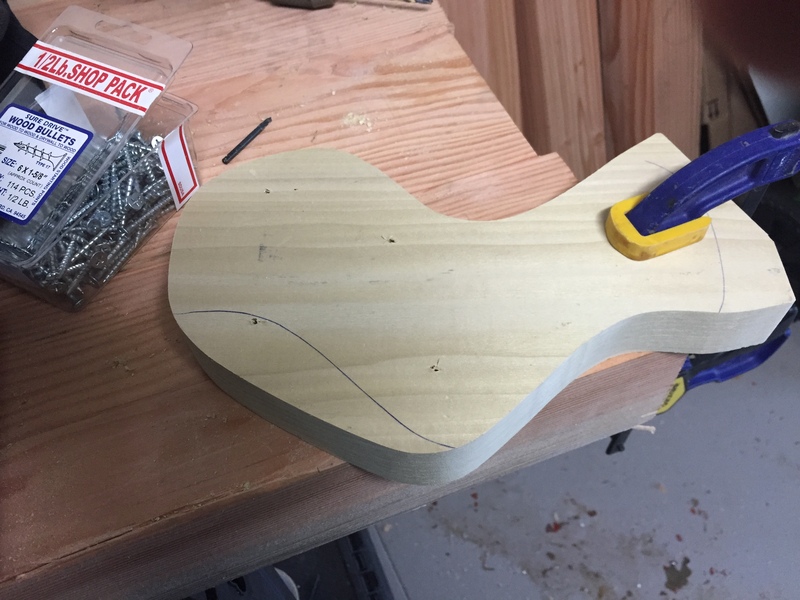 Actually I started building two of them as the boards I could find in the appropriate dimensions included enough for two bodies and two sets of rockers. Since this was my first time building one of these I decided two complete both and give the nicer one to my son and the second one would go to my coworker whose due date was about a month after ours. Well the best laid plans were destroyed by a project at work and now my goal is to complete the project before my son’s first birthday. 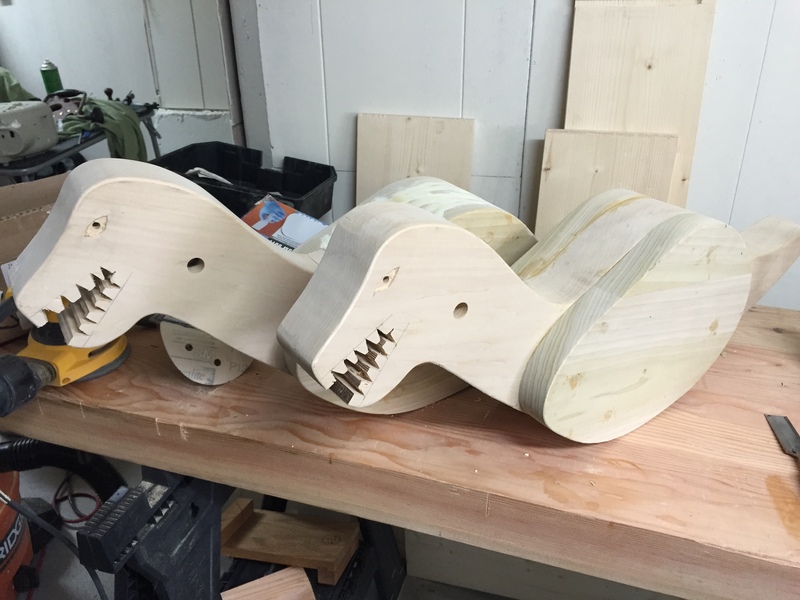 Since I have not spent any time in the shop with week thanks to car shopping, a cold, and general laziness I decided I will compose a few posts on previously completed work for the rocking dinosaurs. Today it will be something very boring, making the screw holes for attaching the legs to the body. 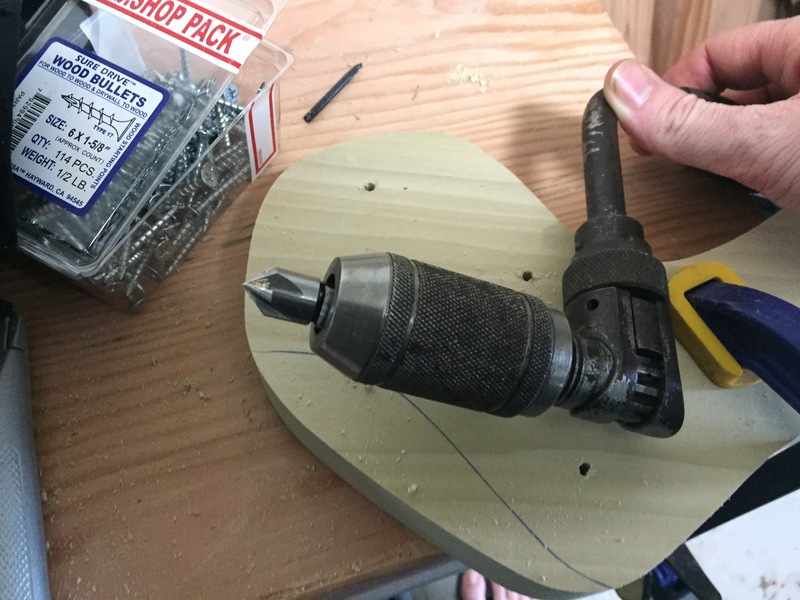 I had previously used the drill press at TechShop SF to drill screw holes/countersinks for the legs but the drill bit included in the old countersink set was smaller than the screw shaft and I wanted to relieve the back side of the hole to make sure the screws would pull the pieces together tightly. Since my cordless drill was long since dead, I pulled out my Miller Falls #2 “eggbeater” drill and secured the appropriate sized drill bit to make sure the hole in the leg was bigger than the screw (this will prevent the screw from binding on the leg and allow it to pull the leg into the dinosaur’s body). Now I used a dedicated countersink in my brace to cut a relief edge on the back side of the leg. 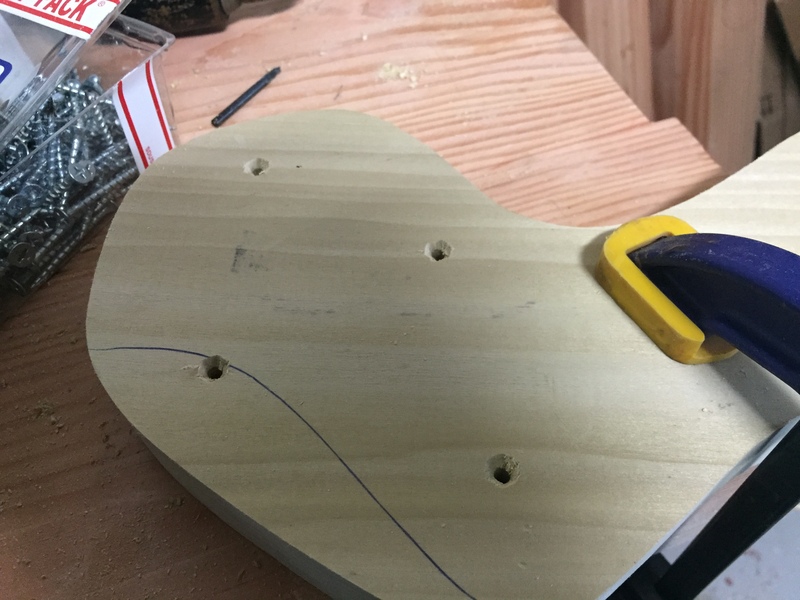 When a screw enters wood it compresses the wood to make room for the screw but some of the wood is forced “up” and this can result in a small mound where the screw enters the wood (this effect is even worse when you use self-tapping screws without pilot holes like I am). This mound of wood can force the two pieces apart, creating a gap. 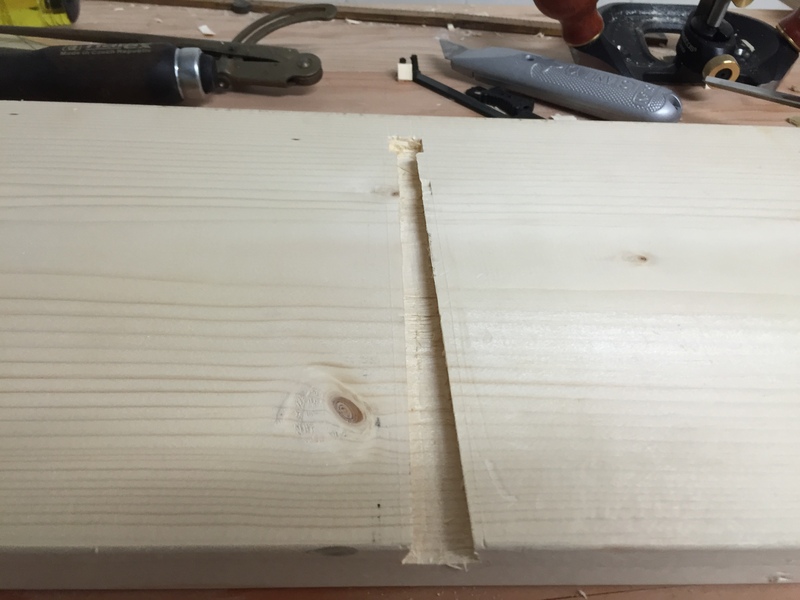 All of my prep work paid off and the joints went tightly together. After hammering in some pegs I cut from the same board I set it aside to dry and started on the second. Hopefully I can get this done in the next two months. 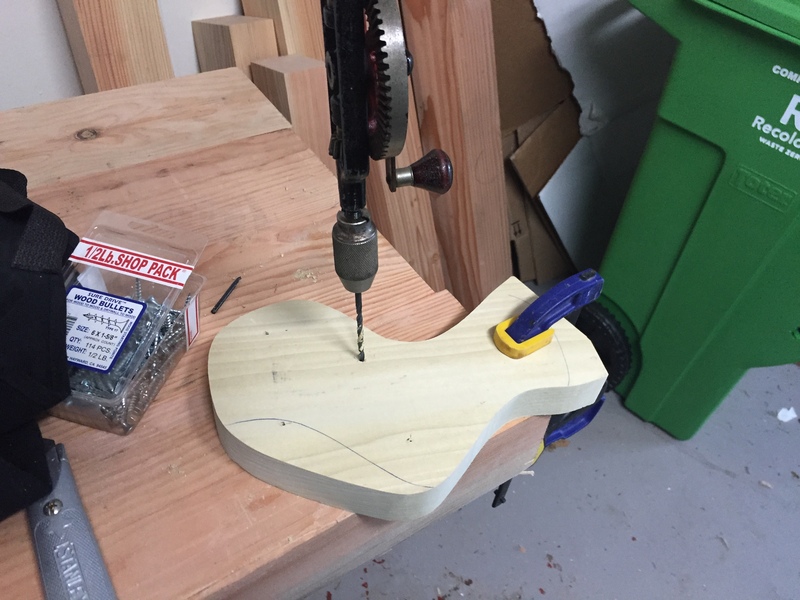 In my continuing quest to not be embarrassingly bad at hand tool work I decided to add a learning project to the queue of house projects demanding attention. Now that we have moved everything out of storage and into the new house I realized my collection of woodworking magazines and books are a bit out of control. Eventually I plan on building a version of the Harvey Eliis Bookcase from Robert W. Wang’s book Classic Arts & Crafts Furniture (http://www.shopwoodworking.com/classic-arts-crafts-furniture-u3160) but in the meantime I decided to build a small bookshelf out of dimensional pine from the hardware store but to make it interesting I decided to use tapered sliding dovetails for the construction. I had recently watched Roy Underhill’s episode “The Case for Books” where he demonstrated making tapered sliding dovetails for a multi-part bookcase and used his layout technique. 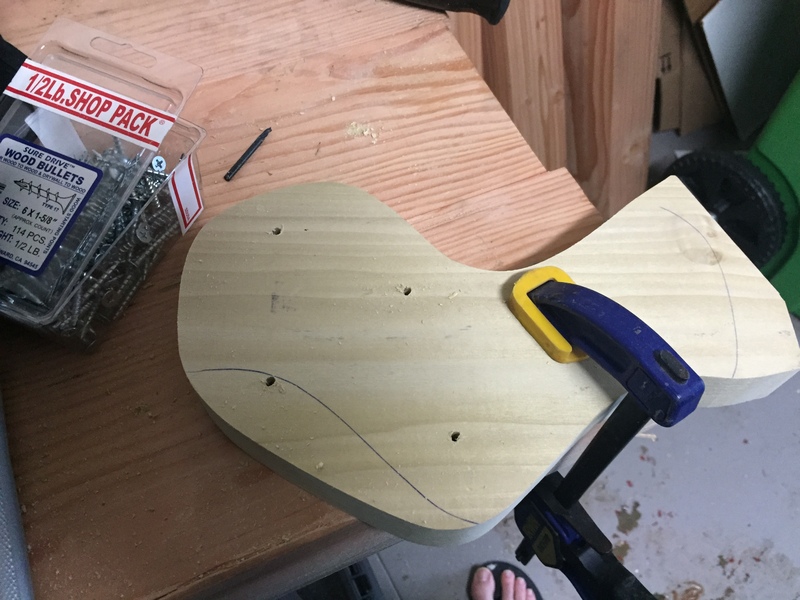 I was looking for some decent 1X12 boards at the local hardware store but only the 1X10s looked usable so I bought three boards and cut out the side pieces leaving enough wood for one shelf from each cutoff. 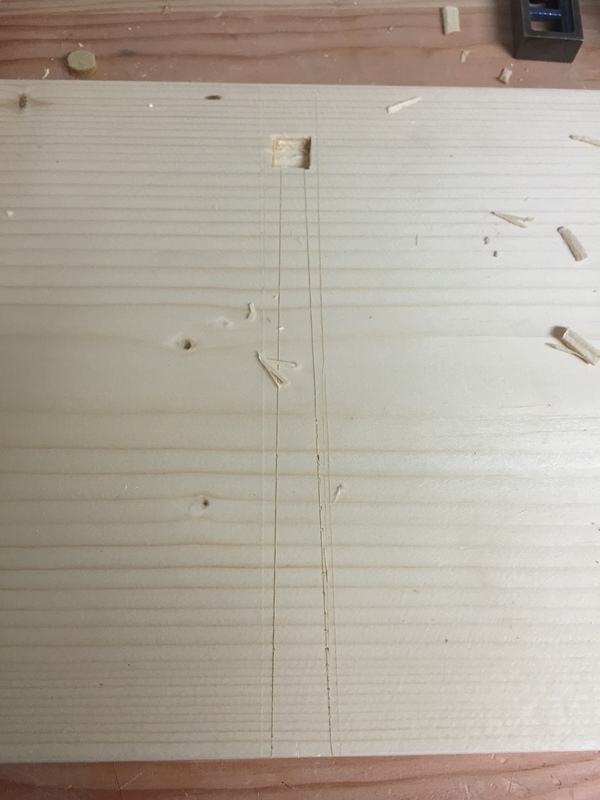 First the layout; each dove tail has a 2:1 slope (1/4th inch deep and 1/8th of reduced with) and tapers down in width by 1/8th of an inch on each side. The dovetail is only 8 inches long so this results in a fairly intense slope so not sure how well this will hold up. My two “new” sets of dividers helped out immensely in this process, they were a good buy. 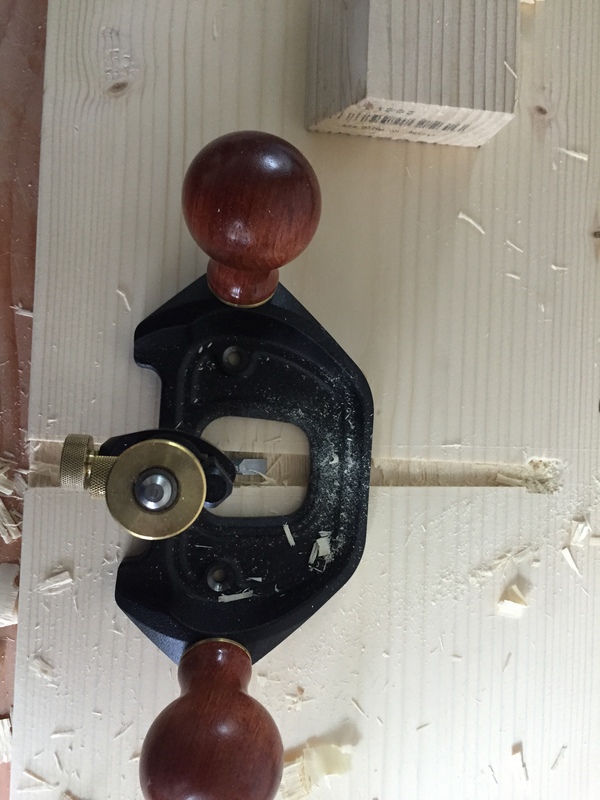 Then just like in the stopped dado I chop out a relief are for the end of the saw; the nice thing is that because of the taper, the entire square will be covered by the self so the edges of the hole do not need to be perfect. 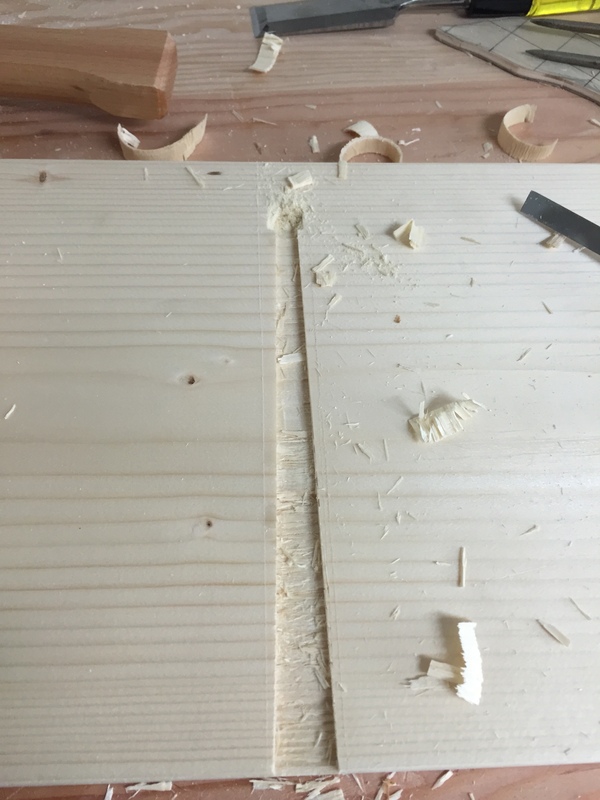 Because I am still getting used to hand saws I am cheating by using a cleat that have the 1:2 angle already cut on it and my Bad Axe hybrid saw makes quick work of the cut. 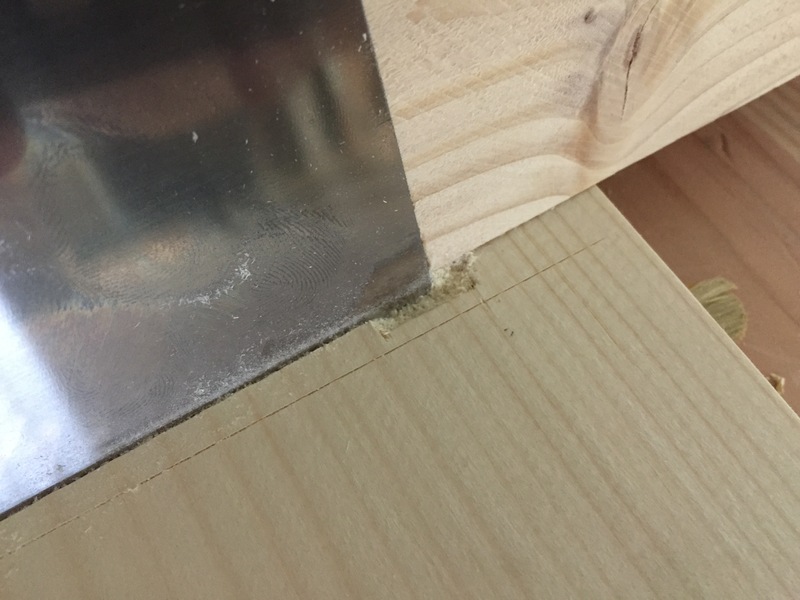 You can see how the relief cut makes a room for the end of the saw. 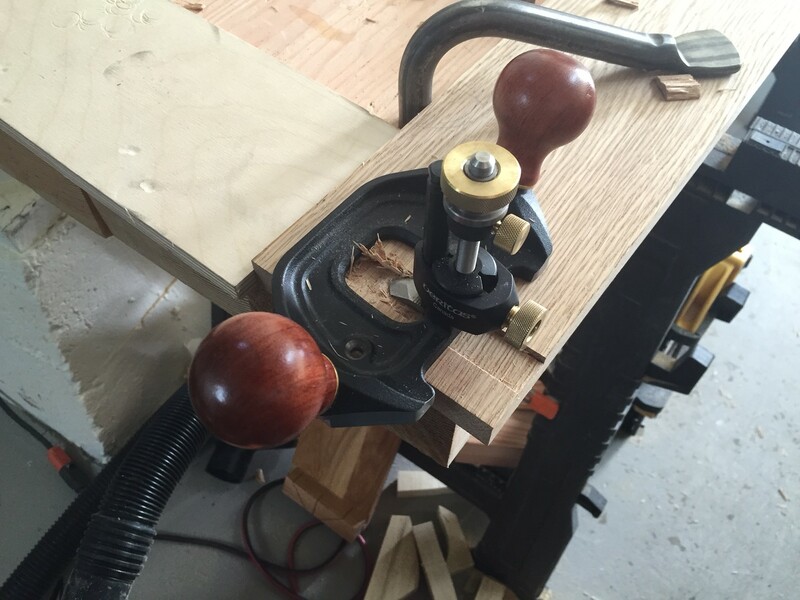 After cutting the other side most of the waste is zipped out using a chisel bevel side down and then a router plane flattens out the bottom at the final depth. 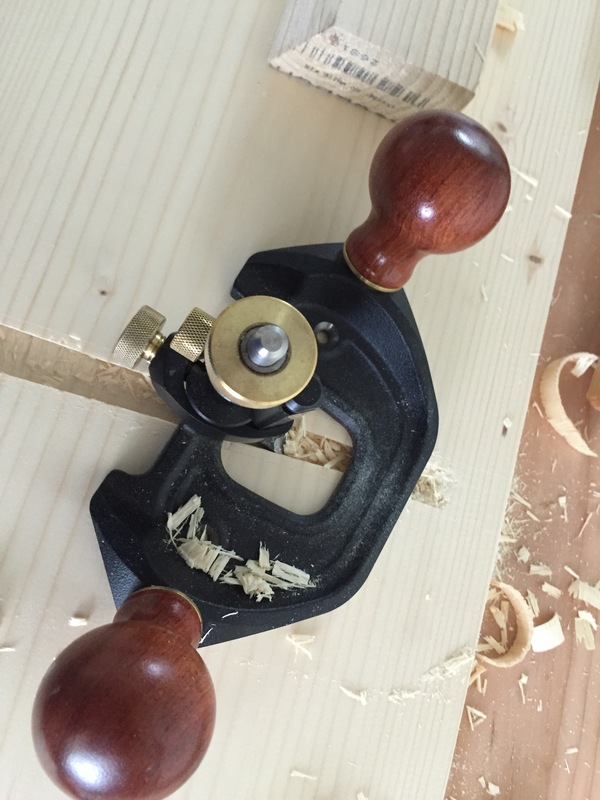 Don’t forget to clean out the corners by skewing the router plane so the blade works its way under the top edge. 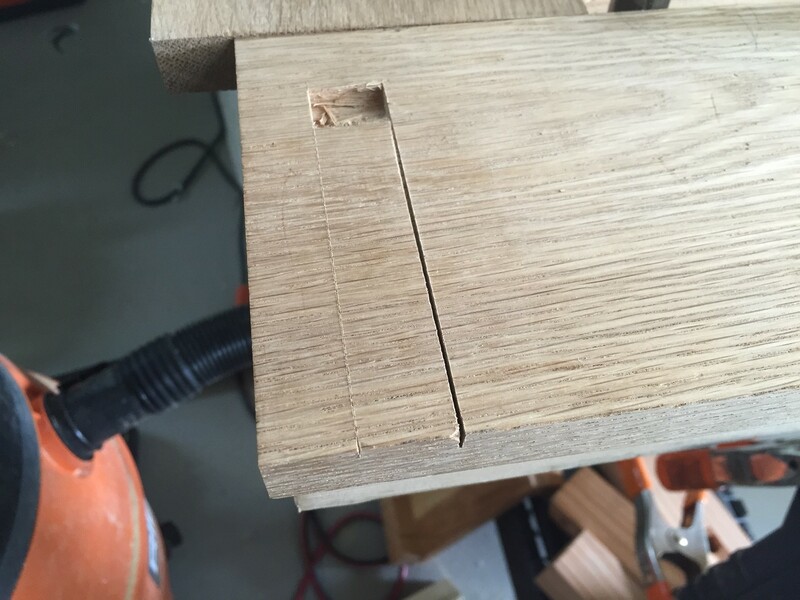 After a bit of cleanup work with a chisel we end up with a nice tapered dovetail slot. Update: I have since learned that it is better to keep once side of the slot square and to only dovetail/taper the bottom side of the shelf. It is also worth noting that this a much higher level of taper than you would use on hardwood or even good softwood, this pine was very squishy. Well it’s nice to finally finish one of the multiple projects I have going on. 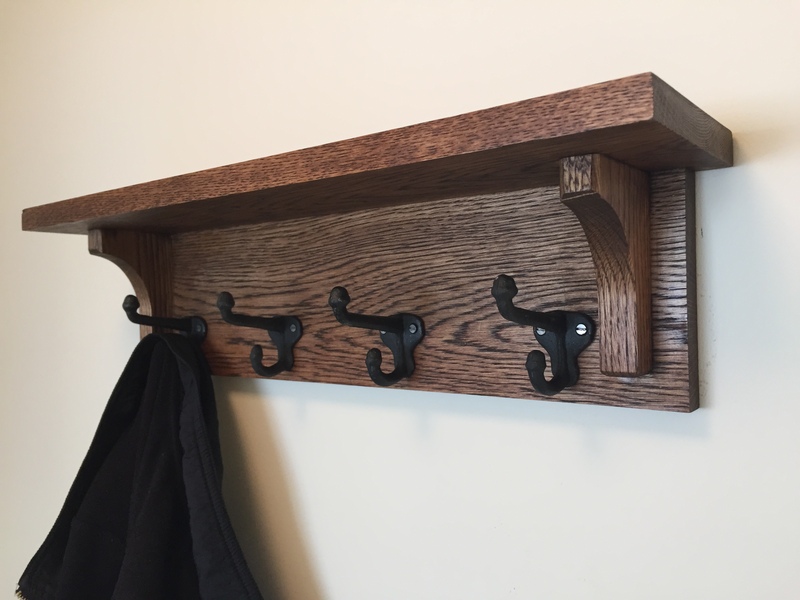 After making a mess of my first use of liquid hide glue I put a few coats of Watco Oil Varnish blend in Walnut and let it dry over the holidays. Apparently my sanding job was not great (the free wood changed grain so frequently I gave up and pulled out the random orbit) but all in all it came out pretty decent. It’s not the prettiest thing I have ever built but it is functional (and hopefully temporary). 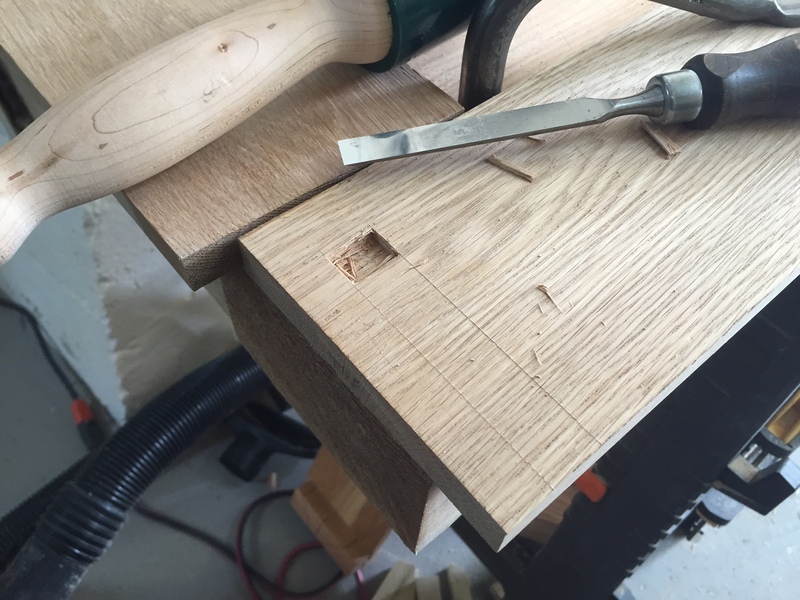 Well every blog needs a first post and I guess mine is going to be on stopped dados cut by hand. 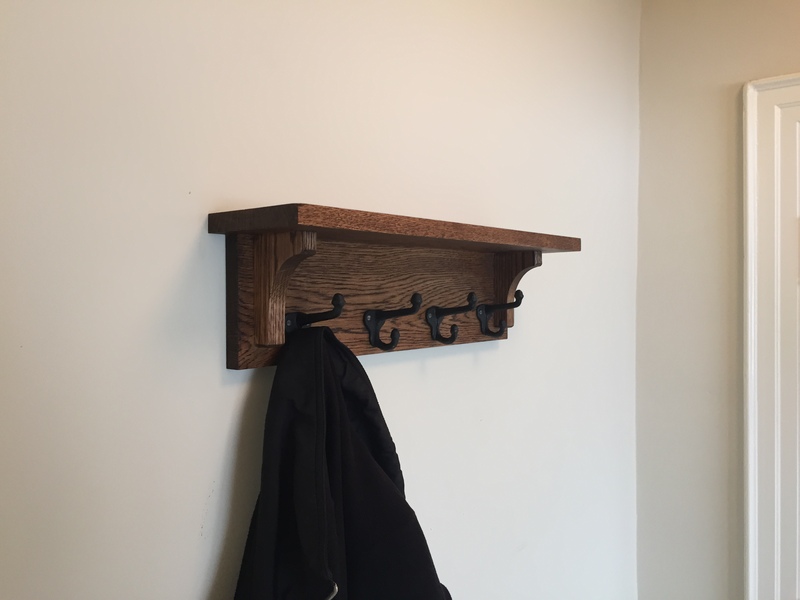 My wife wants some coat hooks by the front door and once I have time I plan on building a large Arts & Crafts style entry mirror complete with hooks but in the meantime I decided to use some plain sawn white oak a friend gave me when he moved to London to build a small shelf with 4 hooks underneath. 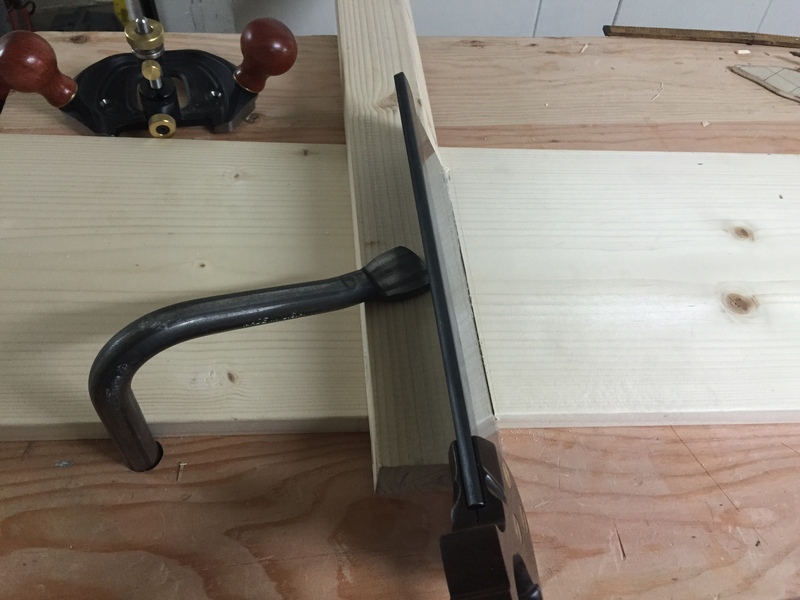 Since across grain glue joint are inherently weak I decided to use a stopped dado for the support piece, the first ones I have ever cut by hand. 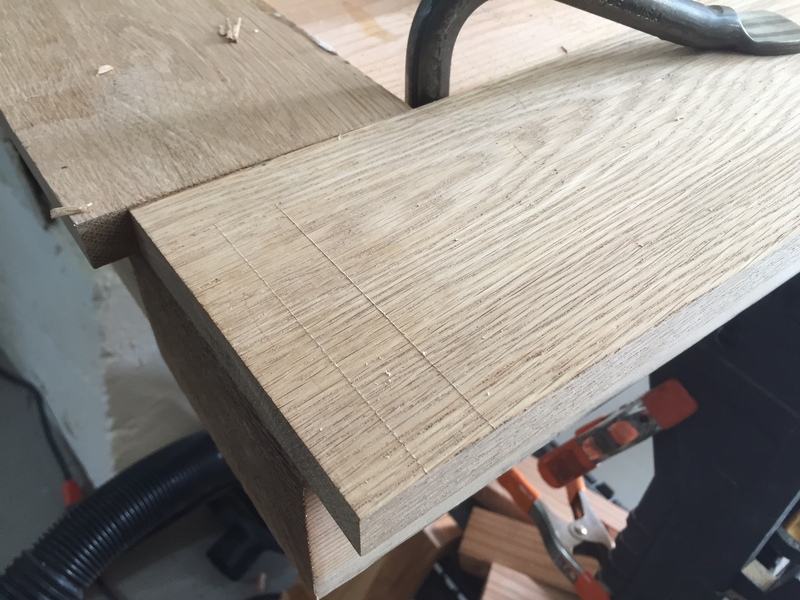 First I used my marking knife to define the edges of the cut and chopped out a relief hole at the end of the dado using my chisel. 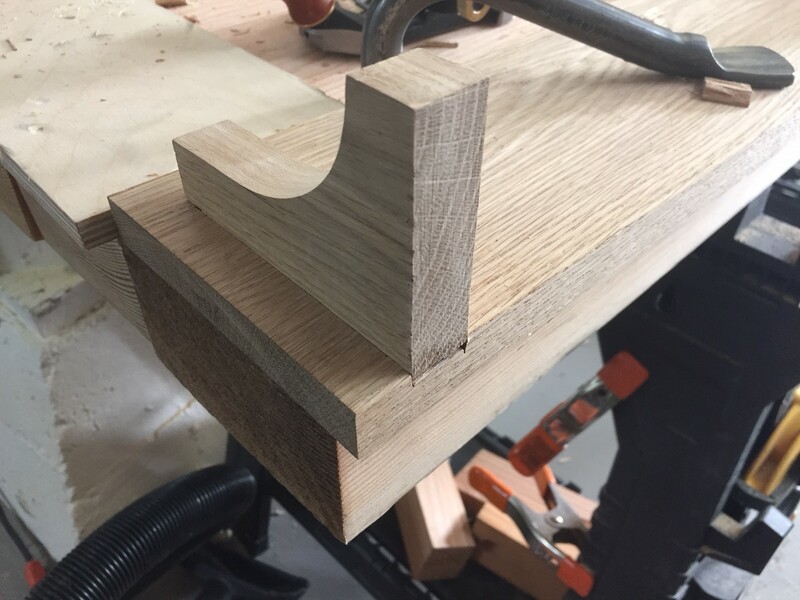 I saw this on an episode of the Woodwright Shop devoted to tapered sliding dovetails and I figured it would work for dadoes as well. 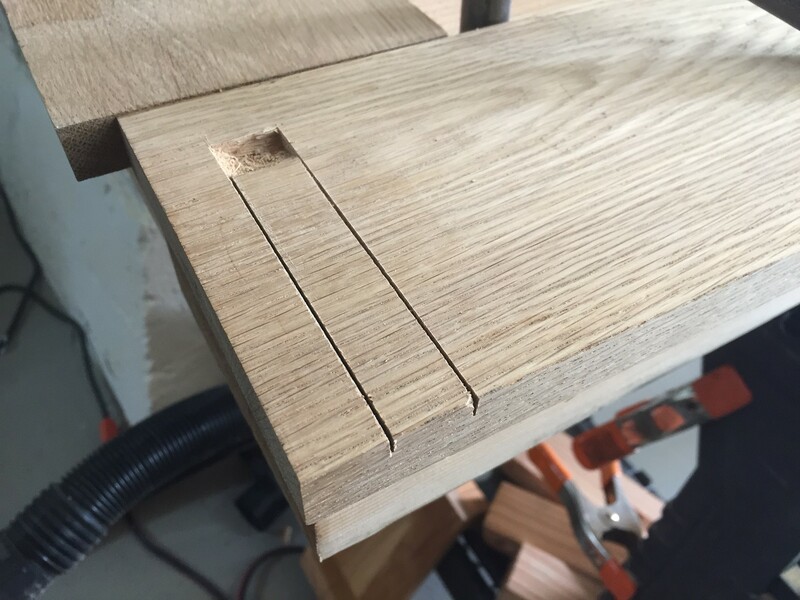 The relief hole gives the end of the saw a place to go so you can saw all the way to the bottom of the dado without the need to over-cut. 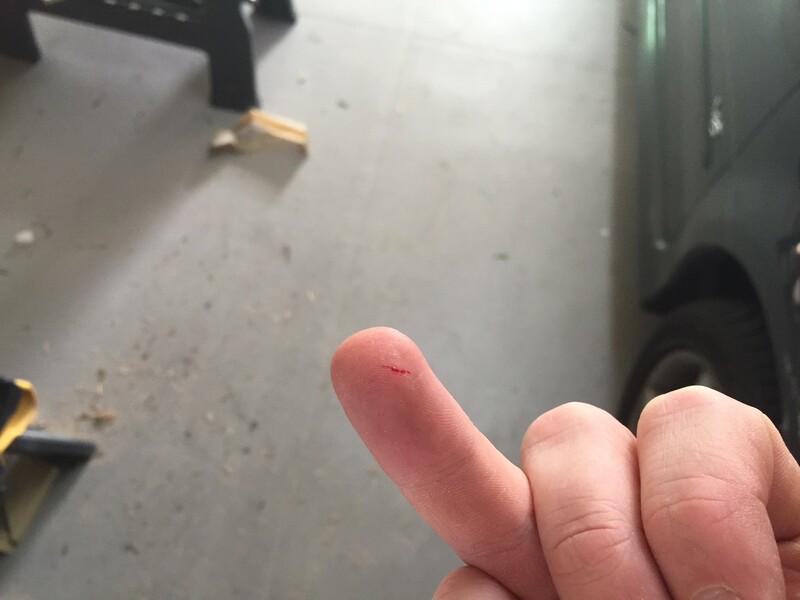 I then cut a notch at the edge of the board for the saw blade to make the cut easier to start unfortunately I channeled my inner Roy Underhill and sliced my finger open in the process. 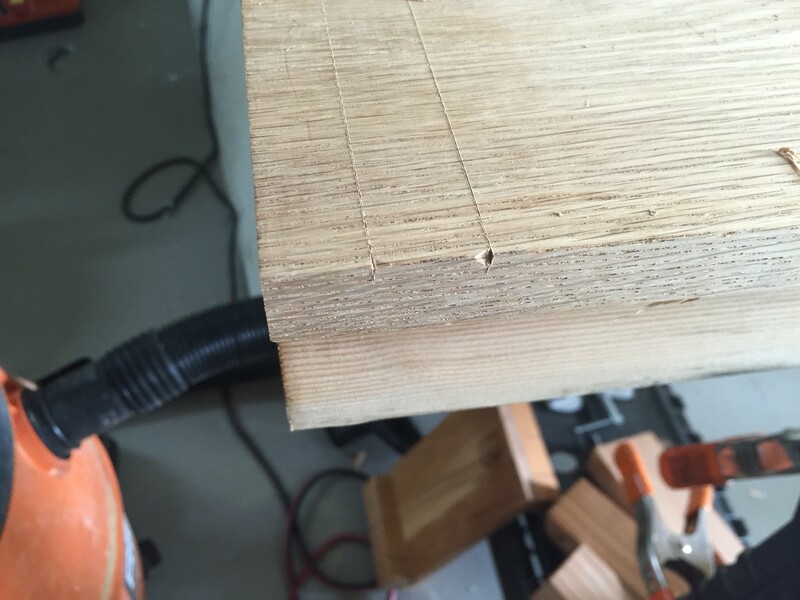 Now it was just a simple process of starting the saw cut at the notch and working along my marking line until the tip of the saw rested within the relief hole, then I kept the saw vertical as a cut down to depth. 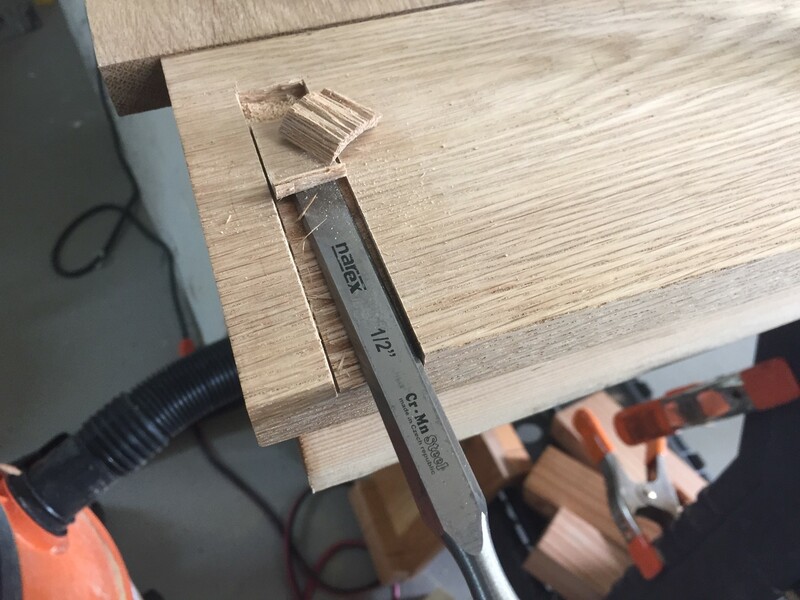 Now I zip out most of the waste with a sharp chisel and adjust the depth with my Vertias router plane (with a pointed blade since this is cross grain). After way more chisel cleanup than I would like the piece fit pretty well. Ill share some pictures of the finished shelf in a later post.